The Parliamentary Select Committee appointed to receive submissions on the appointment of Chief Justice Lombe Chibesakunda has today thrown out the motion for the second time. The committee has since informed the Speaker of National Assembly Patrick Matibini to write to President Michael Sata advising him to nominate another name. But as usual, even when there is clear evidence that the committee is currently sitting to ratify Justice Chibesakunda who was nominated by her relative Sata, Chief government spokesperson Kennedy Sakeni insists that no such appointment was made by the president. The committee that sat today also received submissions from the Law Association of Zambia (LAZ), the Judicial Service Commission and Transparency International Zambia (TIZ). According to a source, The LAZ submitted that it was illegal and irregular for President Sata to nominate Justice Chibesakunda and that the association was not going to support the motion. TIZ also submitted that it was illegal and unconstitutional for Mr. Sata to nominate Justice Chibesakunda who is above the retirement age. It is only the government appointed Judicial Service Commission that supported the motion to appoint Lombe Chibesakunda. According to the source, the motion was again put to a vote and those against the appointment of Madame Chibesakunda again won. As it stands, Parliament has refused to entertain the appointment. Meanwhile, the source has also disclosed that LAZ submitted that Ms. Chibesakunda was actually serving illegally because she had already served her contract during the reign of President Rupiah Banda. 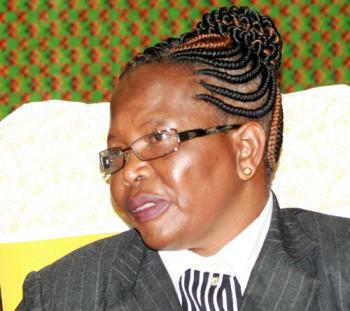 The source said LAZ has been looking for a formal letter of appointment for Madam Chibesakunda but can not find any. The source said it was actually a constitutional breach for Chibesakunda to be serving minus a letter of appointment. LAZ even wondered how she was drawing a salary minus formal appointment. Legally the person who qualifies is one who is serving his or her tenure. The source said Electoral Commission of Zambia Chairperson Ireen Mambilima qualifies because she is 60years and still serving her tenure up to when she reaches 65 years. The source said the view of LAZ is that Ms. Mambilima was the right person because she was ratified by Parliament as Deputy Chief Justice. President Sata has since threatened to dissolve parliament if they do not endorse his illegality. The committee comprises Stephen Chungu who is Luanshya PF MP, Mwimba Malama Mfuwe PF MP a Mr. Mumba also from PF. Others are Kabinga Pande from MMD, Victoria Kalima MMD and Situmbeko Musokotwane MMD, Ms. Imenda from ADD who is chairperson, Jack Mwimbu from UPND and Patrick Mucheleka independent.